Step into the Middle Barn at Vermont Family Forests’ Anderson Wells Farm, and you’ll see why it’s the perfect site for so many of VFF’s gatherings. 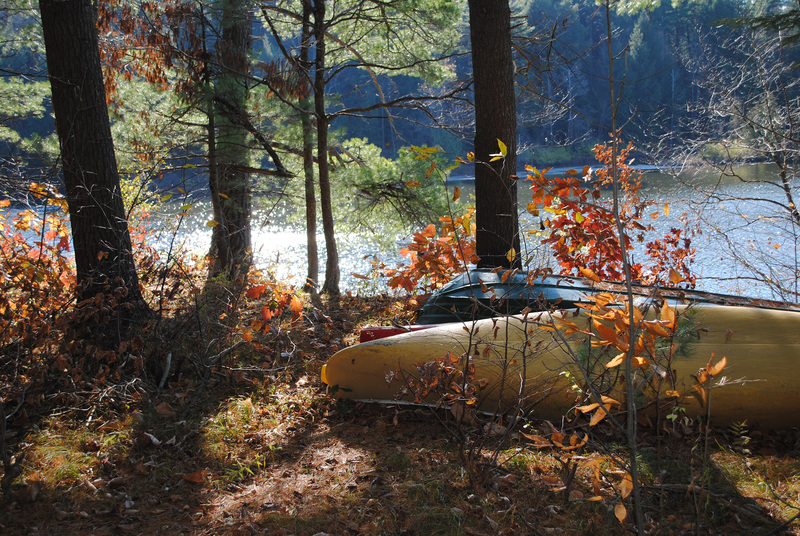 We’ve held concerts, workshops, and landowner gatherings in its spacious, rustically beautiful interior. On warm summer days, we roll open the north door, revealing a riot of color from the garden nearby and the fields and forest beyond. 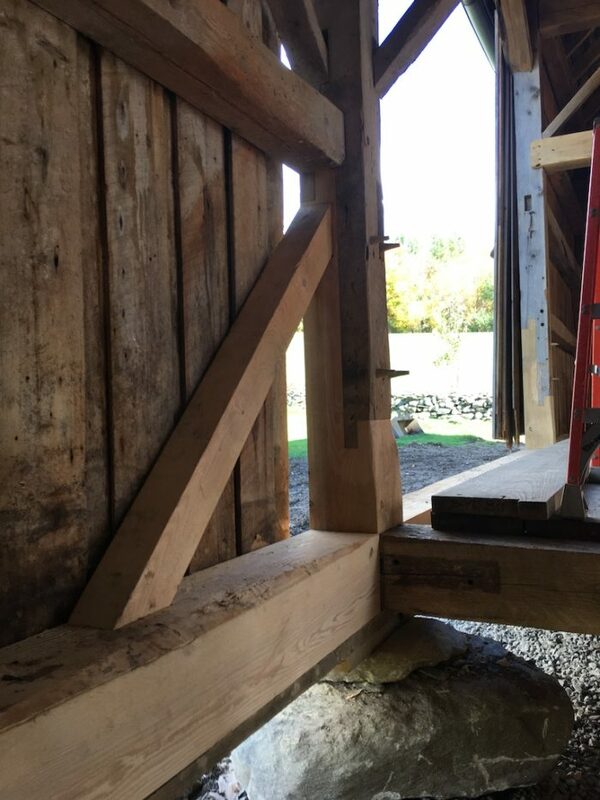 Before the restoration, the barn’s sills were flush with the ground, causing sills, posts and sheathing to rot. 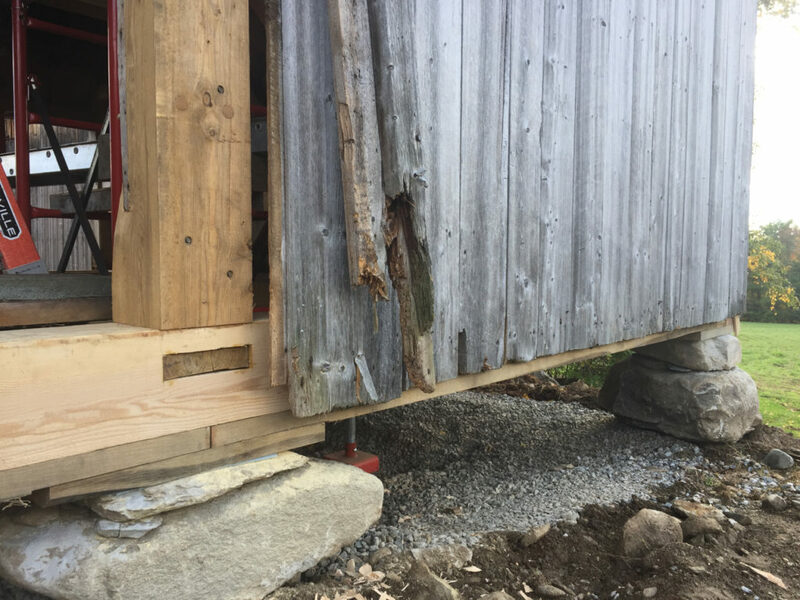 To correct this, the crew raised the barn on jacks, poured 24″-diameter Sonotubes of concrete, and topped them with rocks from the original foundation. 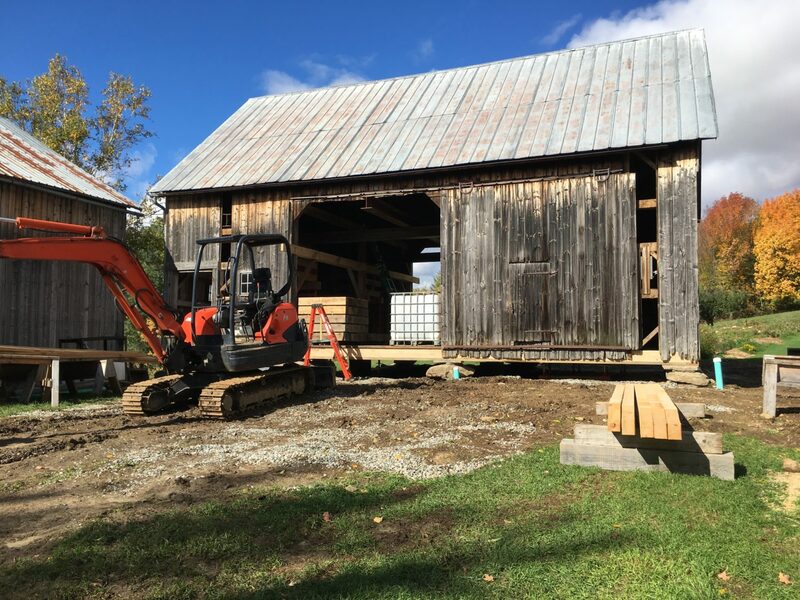 When they settled the barn back onto its new footings, it stood 14 inches higher than before. Crews installed a new French curtain drain around the barn. Gutters will drain into the blue plastic piping (center and right), moving runoff away from the building. A white oak mud plate rests on the footings, topped by and 8″x8″ hemlock timber sills. The original 8/4 white pine flooring, removed during the renovation, is back in place. The barn is lagged into the concrete sonotubes with 1” threaded rod, which we hope will keep the building in place in the face of those legendary Lincoln winds. The Middle Barn has been leveled and plumbed, maybe for the first time ever! 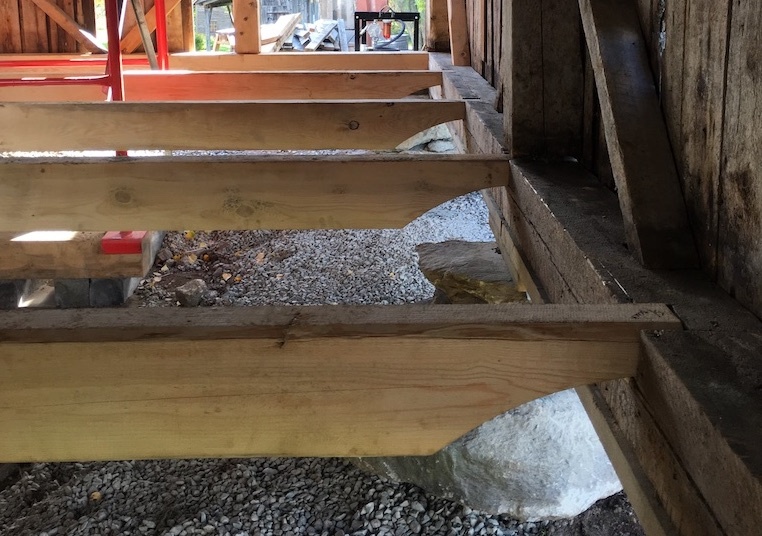 The new 4″ x 8″ hemlock joists are a work of art. 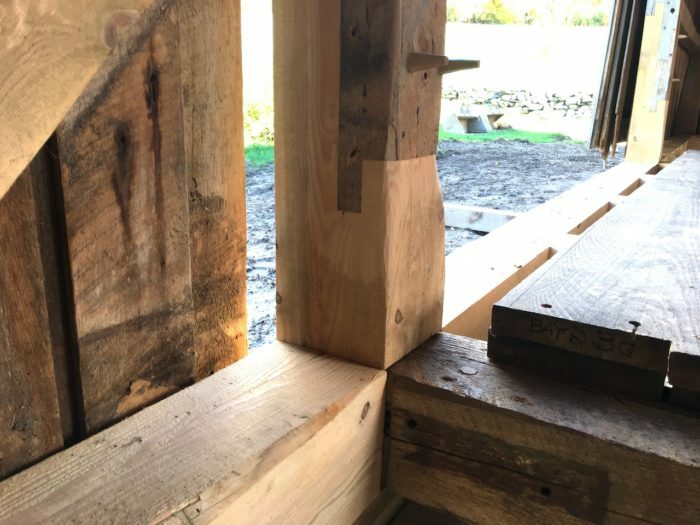 Notice how each joist ends in a curve, resting in a mortise 4” deep—that prevents splitting on the end). New braces (diagonal timbers) are pegged with white oak trunnels. Old meets new at a really tight, beautiful scarf joint. Every effort was made to retain all solid pieces of the original frame. 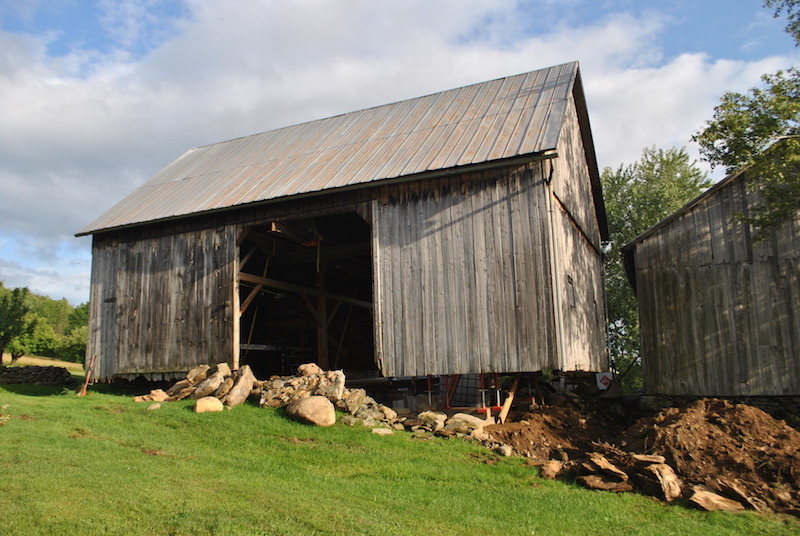 The barn was rotting from the bottom up because a well-intended 1935 renovation had poured concrete right up to the sills. Miles Jenness, who led the restoration effort, put it well when he joked that renovations like that one represent full employment for area timber framers. 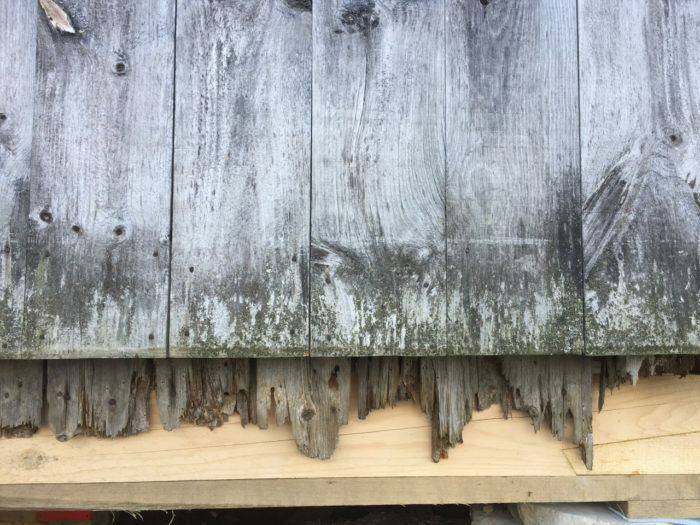 The ragged bottom edges of the barn’s spruce sheathing peek out behind the open barn door. 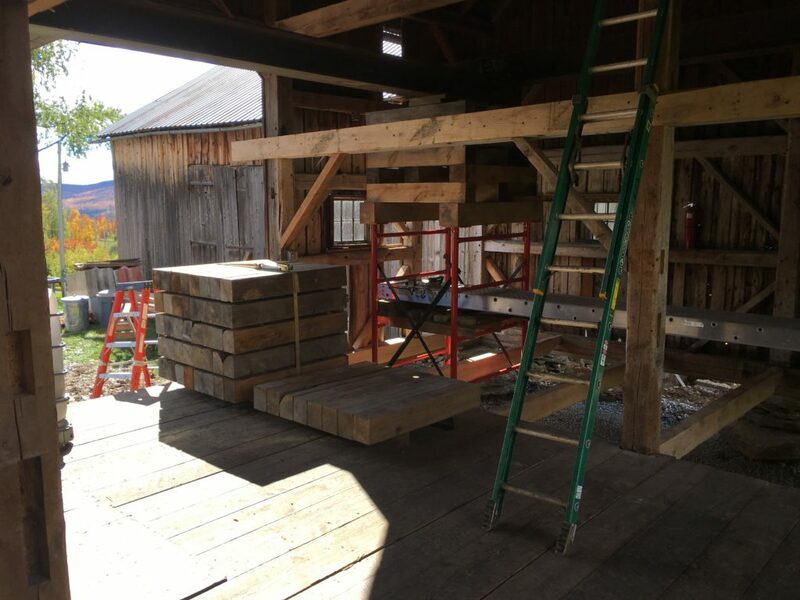 Rather than removing this sheathing, which is largely sound, except for its bottom edge, we’ll be adding a fresh layer of spruce sheathing to the exterior, which will beef up the barn’s walls. Bring on the winter! The Middle Barn’s ready for it, and for many VFF gatherings to come.